I collect old books. I have a parent’s guide to education, published in the 1940s. It has what needs to be learned in each grade level. Reading is not even mentioned in kindergarten, children are exposed to reading in first grade – it is in second grade that reading is an expected skill. The fifth and sixth grade reading list and level of expectation are far higher than the current common core. Interesting. 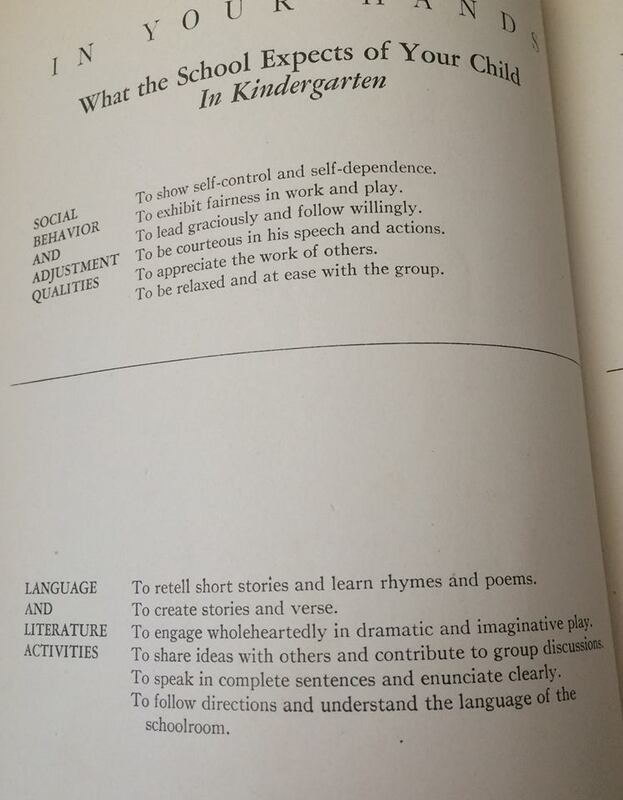 So why does Waldorf Kindergarten promote cooking (knitting, painting,gardening, etc) and shun the teaching of reading? Here’s the simply explanation: Cooking builds the brain. Reading and writing uses the brain. Reading requires a certain level of brain and body capabilities. Children, especially young children, take in information through the senses. Cooking is a sensory experience. Reading is not. As Rose whipped up the eggs, she commented on the bright yellow color. She listened as I told her to add the coconut oil, maple syrup and vanilla. 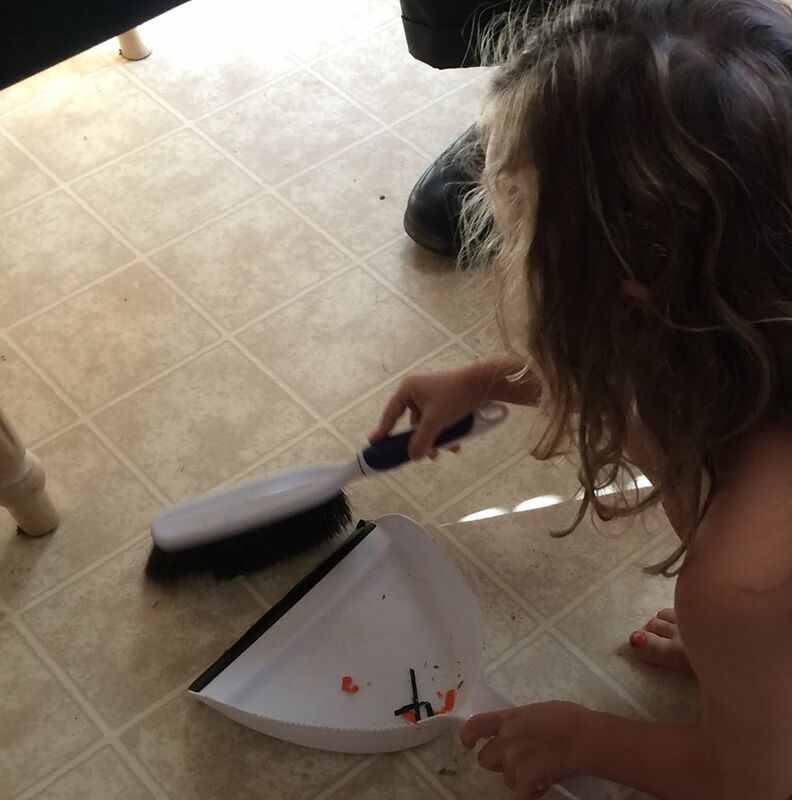 After following directions she commented, “Smell it Mommy. It smells so yummy. Can I taste it?” I made her wait ‘til the batter was complete before tasting it. She felt, saw, heard, tasted and smelled. She didn’t even know that her little brain was working full time to develop and refine her cognitive, social, emotional, physical, creative, and linguistic skill set. She was having fun. Therefore, cooking is more important than reading in Kindergarten because it incorporates all of the senses, which is how children learn best. When a child first looks at symbolic lines – which represent sounds – which when put together make up words – they must track the lines and curves with their eyes. If the eye- tracking is correct the information of the lines and curves travels to the brain and the brain stores this information and labels it as the correct letter or number. They are then able to recall that shape in their brain and read or write it accurately. Visual tracking is developed through hand-eye coordination of solid, sensory objects – such as cooking. Spooning cupcake batter into a cupcake tin uses hand-eye coordination and teaches the eyes how to track and the brain how to record that tracking in long term memory. I have vivid memories of wanting to beat my head against the wall when I was teaching my oldest daughter to read. “If C-A-T spelled cat on the last page, than C-A-T spells cat on this page.” If I only knew then what I knew now, I would have put down the book and picked up the blender. With lots of hand-eye sensory activities, accurate tracking usually is developed around the age of seven. If a child is taught to memorize letters and numbers before visual tracking is developed learning disabilities often occur. For example, the reversing of letters and the inability to recognize the difference between b,d,q and p is a result of learning letters before eye tracking is fully developed. Therefore, because developing visual tracking is so important to the learning process, cooking is more beneficial to kindergarteners than is letter recognition. The proprioceptive system is a sense of one’s own body. In order for a child to sit and pay attention they must have a solid sense of their own body in space and time. Proprioceptive information is received in the cerebellum through the muscles, joints, tendons and ligaments. The proprioceptive system requires large and small motor skills – especially those that that use fingers, hands, arms, trunk, legs and feet. 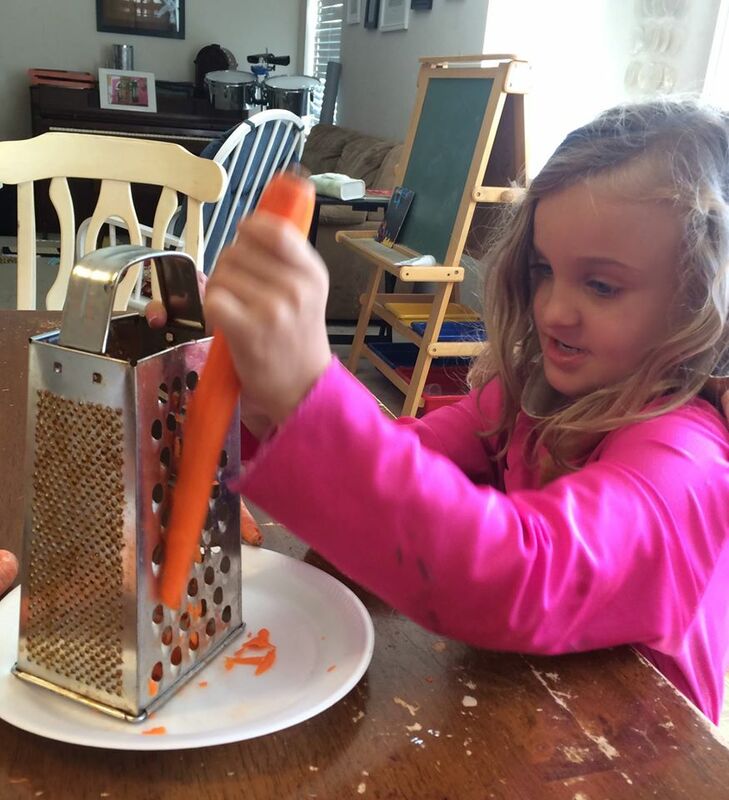 Grating Carrots and using the whole body to stir the flour into the liquid cake mix develops this system. If reading is taught before a child develops the proprioceptive system, they will have difficulty paying attention and following directions. Reading basics will take much longer to teach. 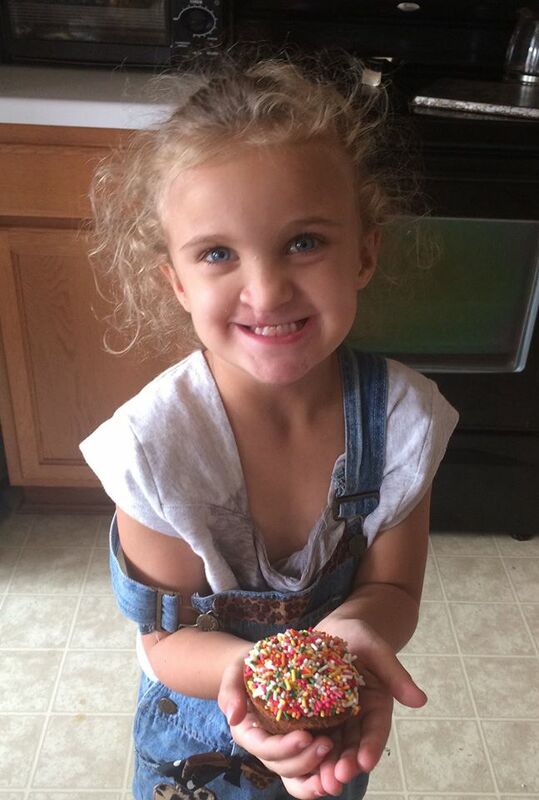 Therefore, cooking is more important than reading in kindergarten because it helps develop the proprioceptive system. Reading takes both sides of the brain. The right side of the brain controls sight reading and memory. The left side of the brain decodes phonics. The ideal way to read is for the left side to read phonetically while the right side creates mental pictures, thus comprehension occurs simultaneously with the reading of the words. Bilateral Integration is when the two sides of the brain talk to each other and work together. Because the right side of body movement controls the left side of the brain and vice versa, both sides of the body must work together to accomplish a task. Sweeping carrot peelings from the floor develops bilateral integration. Therefore, cooking is more important in long term reading success than is the teaching of reading for five and six year olds. 1) Brain needs healthy food to develop properly and research shows kids who cook make healthier food choices. 2) Children learn cause and effect through the whole process – start to finish. 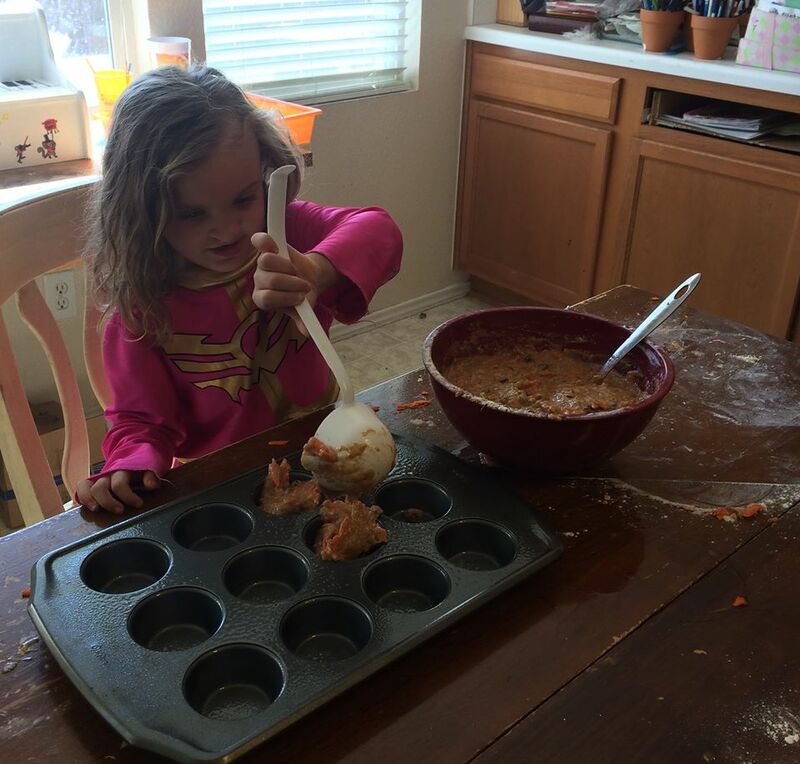 Eggs, flour, and carrots turn into cupcakes when cooked. 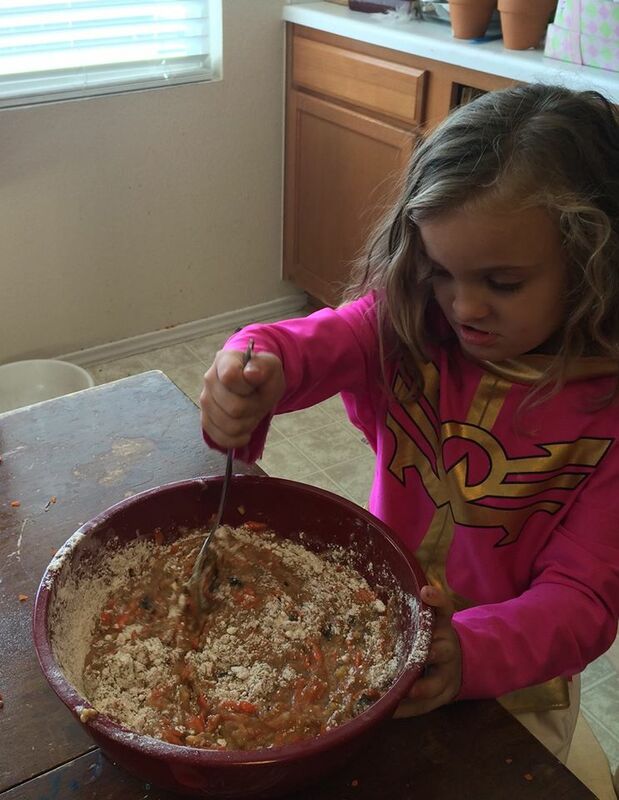 3) Cooking gives a child a sense of self-accomplishment. Whereas, at the age of five, reading pleases their teacher or parent – they learn to perform to please others. Tasting something they cooked themselves gives them gratification which comes from deep inside themself. 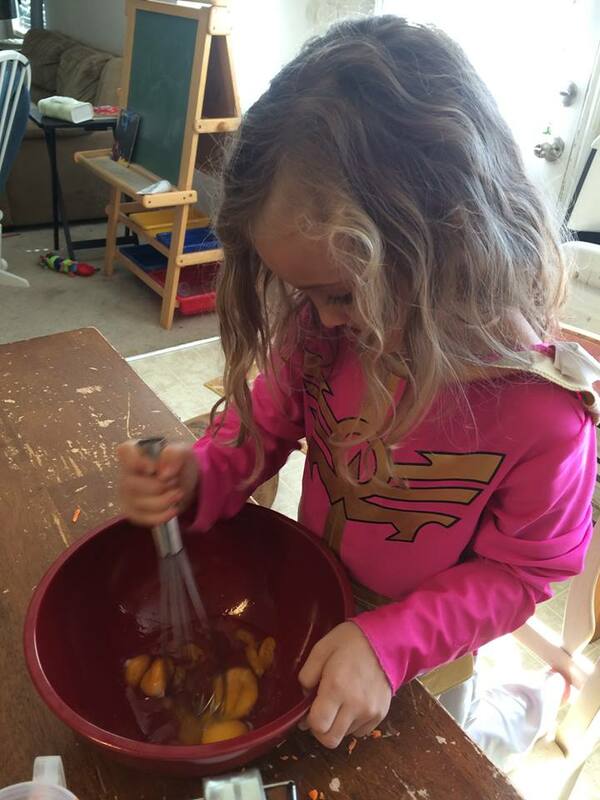 In Kindergarten, cooking is more important than reading because it weaves together sensory, visual, cognitive development and give children confidence and a sense of pride. It creates the pathway from the senses to the brain that will enable them to learn to read. Reading is good, it should be saved and savored for a time when it can be taught with less frustration – a time when children’s brains and bodies are reading to delve into it fully. I know feelings run high on this subject – and I would sincerely appreciate all your comments and thoughts – whether you agree or disagree.